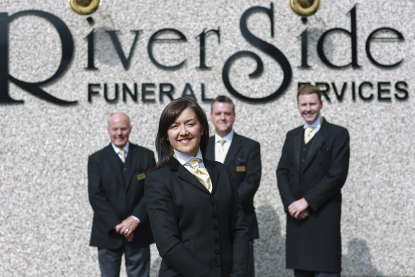 Riverside Funeral Services is an Independent Funeral Directors with two branches based in Ogmore Vale and Porthcawl. The business was established by myself, Michelle Evans, in 2009 and I am very proud to be serving our local community and the Bridgend area as the first 'Female Funeral Director'. I have an extensive medical background, coming from over 20 years service as a midwife. I feel that with my nursing experience and knowledge based background I have much to offer families at a vulnerable time in their lives. The business is operated by myself, but I am supported by my husband and close family. Being an independent family run business I can concentrate on caring for your needs with commitment, understanding and mostly respect. We are also active members of SAIF, the ' Society of Independent Funeral Directors ', so the business is regulated and operates to these high standards. At Riverside Funeral Services I have a purpose built Chapel of Rest with disabled access and a private reception area which has a non-threatening and calming environment. A funeral is always a sad occasion, but I believe that the level of service I can offer can help lessen the trauma and stress of these sad times. I understand that losing a loved one is never easy to cope with, and the added stress of making arrangements for the service can bring further emotional upset, through making funeral arrangements I have learnt how to help families have their own unique service. It is this personalised approach which often supports our families through their process of bereavement.